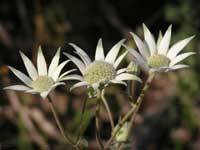 Flannel Flowers. It is not until you look closely at their petals that you understand the name. The petals are really bracts. The flowerheads are in the centre. They all belong to the Actinotus genus, family Apiaceae. The Apiaceae family includes carrots, parsnip and celery, and a host of herbs such as parsley, caraway, coriander and fennel. And hemlock. 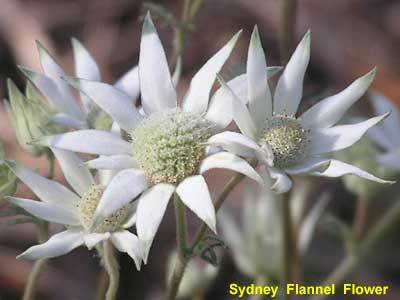 Although sometimes referred to as the Sydney Flannel Flower, it is usually simply known as the Flannel Flower. 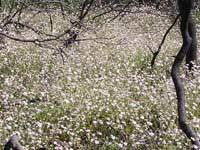 It is prolific in the sandstone national parks in the greater Sydney area and can be sometimes found in spectacular drifts. 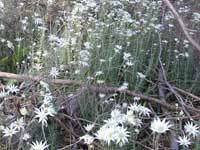 The flowers are about 50mm in diameter and appear in Spring. Note the soft light green bract tips. 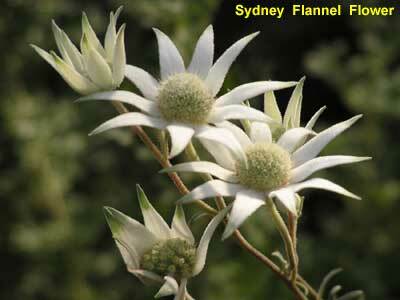 The photos of the Sydney Flannel Flower were taken in the Lane Cove National Park in Sydney. 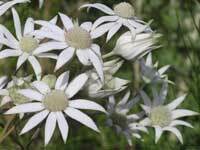 This is the Lesser Flannel Flower, although in this case less is certainly more as it peppers native woodland and open forest in spring, summer and well into autumn. It is both prolific and hardy. 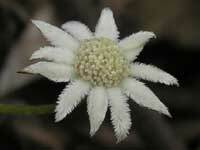 Its flowers are about 10mm in diameter. 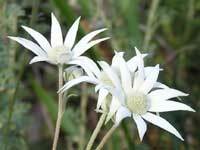 The photos of the Lesser Flannel Flower were taken in the Upper Blue Mountains. 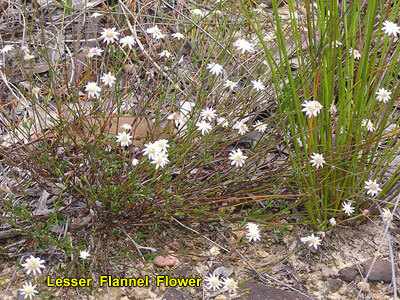 Until a few years ago, the stunning Pink Flannel Flower was rarely seen as it only appears in the summer following a bushfire. Recent bushfires and controlled burns in the Blue Mountains has meant that it is no longer rarely seen. 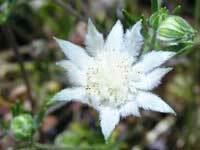 The Pink Flannel Flower is also known as the Ridge Flannel Flower as it is found on ridges. 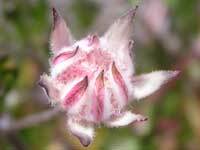 Its flowers are about 20mm in diameter. 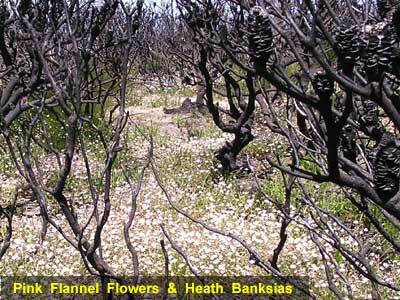 The Pink Flannel Flowers pictured here appeared in the summer following the December 2002 bushfires in the Blue Mountains. 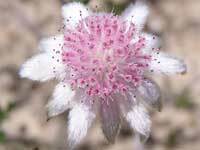 As with banksias, it is believed that the seeds require smoke to germinate. These seeds could have lain dormant for decades. Shown here are the burnt remains of a grove of Heath Banksias. 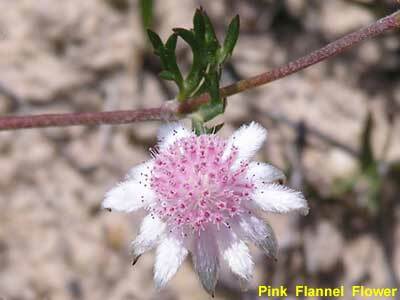 Although not shown clearly, there were hundreds of banksia seedlings amongst the Pink Flannel Flowers. 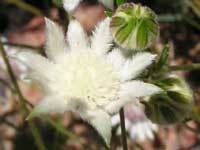 Here's images of a cream and a white Pink Flannel Flower. 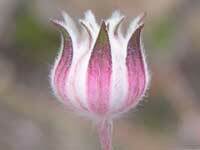 The photos of the Pink Flannel Flower were taken in the Upper Blue Mountains.